The Terriers' hopes of winning their first Beanpot since 2009 went unanswered as the team lost to Northeastern, 3-2, in the tournament opening round. It was BU’s second one-goal loss to the Huskies in the past month. Kevin Roy, who scored all three NU goals, got his team on the board early, but it was matched minutes later when Danny O’Regan scored his 10th of the season from captain Wade Megan and Evan Rodrigues. 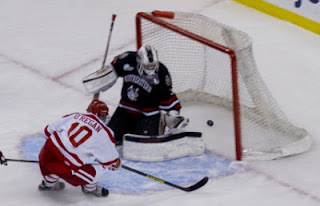 Roy scored the eventual game-winner on a turnover in the second period and scored again late in the third period before a BU extra-attacker goal by Sahir Gill narrowed the margin to a goal. Matt O’Connor had 23 saves for BU, who will play Harvard next Monday in a rare consolation game appearance. Former Terrier goalie Grant Rollheiser has signed on with the ECHL Idaho Steelheads. Earlier this season, he played 19 games for the Utah Grizzlies. The #3-ranked Terriers’s pursuit of their first-ever Beanpot title begins tonight in an 8 p.m. start against Northeastern at Matthews Arena. The two teams met this past Saturday with BU winning 4-2 at Walter Brown Arena.